I like to get R involved with cooking and baking (mostly in the hope that one day she’ll spontaneously make me a cup of tea and a roast dinner). Getting her to help with making her own dinner has some obvious advantages – it’s a great way to use that awkward bit of time before tea where she can get a bit cranky; she seems more willing to try things if she’s been involved in the preparation; and of course, dinner is made at the end of it. The biggest success to date – as far as savoury food goes – is making pizza. Every so often I make a big batch of pizza dough and tomato sauce and then freeze it in individual portions (recipe below). When we need an activity and food for later I take it out of the freezer in the morning and then we make it in the early evening. I roll out the dough really thinly and put it on an oiled baking tray (I tend to do that bit before she gets involved as she gets a bit bored by the rolling out). I prepare the toppings – the tomato sauce in a bowl with a spoon, a pile of grated cheese, and some vegetables. Our most recent effort was sliced mushrooms and a handful of (defrosted) frozen sweetcorn, but slices of pepper work well, as do sliced cherry tomatoes, a bit of defrosted frozen spinach, broccoli, leek, olives – well, you’ve had pizza, you can work it out. Of course, you can put meat on too. R then smooshes the tomato sauce all over the base, puts the cheese on, and arranges the toppings. I’ve found this is also a good way to get her to try different raw veg before we cook the pizza too – she’s attempted vegetables that she would just chuck at me if I served them to her as part of a meal. She then likes to tell me what all the vegetables are when she’s eating the pizza. Pizza Recipe – this will make a big pizza for two adults and a baby. What I usually do, though, is divide the dough up into eight pieces, wrap them in cling film and freeze them. I divide the sauce up into eight individual portions (I use little freezer bags) too. Lightly grease a pizza tray or baking sheet. Put the flour into a bowl with the salt (if you’re using it) and make a well in the centre. Pour in the oil and most of the water. Mix until you have an elastic but not sticky dough, adding more water as necessary. Transfer the dough to a floured surface and knead until it is an even colour and feels uniformly elastic. Roll out the dough, shaping it into a round or oblong to fit your tray. To make the sauce, heat the oil in a saucepan and fry the garlic for a minute or so. Add the remaining ingredients and simmer uncovered, so that the liquid reduces, for about 10 minutes, until the sauce is thick enough to cling to a pizza dough base. Preheat the oven to 220ºC/425ºF/Gas Mark 7. Spread a layer of tomato sauce over the base, sprinkle with grated cheese and add any additional toppings, including a final layer of cheese, if you like. Put the pizza in the oven and bake for 10-20 minutes, until the topping is bubbling in the middle. 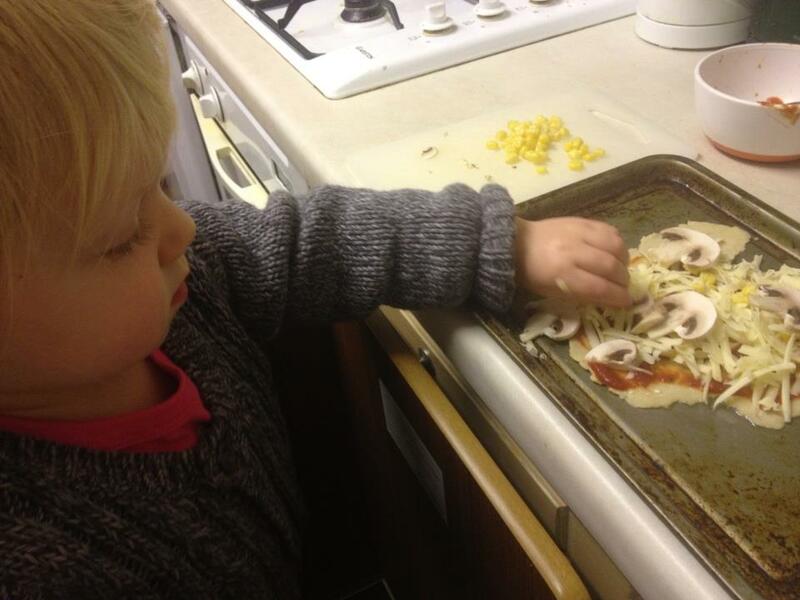 This entry was posted in food and tagged activity, cooking, food, pizza, toddler, vegetables. Bookmark the permalink. Oh that’s a good idea – I think R would like that too. I keep meaning to try pesto pitta as well, with some cheese and pesto mixed and then put in the middle and then in the toaster. Sounds nice but I haven’t actually got round to doing it. loved making them together and loved eating them too – he ate sweetcorn!!! i will be doing these again!! Making bases in advance! That’s a ridiculously clever idea!!! 🙂 Will have to pinch that to go with my organised girl new year’s resolution! It is so ace when you’re too knackered to make anything.